Take your Java/XML skills to the next level by converting your XML into other formats with the very powerful Xalan XSLT engine. The past couple of weeks have been fairly hectic. I've finally got my arms around Java-based XML parsing with the Xerces parser, and have successfully figured out the basics of SAX and DOM programming with Xerces. Hey, I even managed to do some simple XML-to-HTML conversion by adding a little JSP to the mix. In this article, I'm going to take things further, exploring yet another addition to the Java/XML family. It's called Xalan, and it's an XSLT transformation engine that should substantially simplify the task of converting, or "transforming", XML documents into other formats. I'll be looking at the basics of the Xalan engine, demonstrating how to write Java applications that can be used to convert XML data into regular ASCII text files and browser-readable HTML. And, of course, I'll come up with a number of silly examples to amuse myself (and hopefully, you). Sounds interesting? Flip the page for more. Xalan is an XSL engine developed by the people behind the Apache Web server. Consequently, it's fairly feature-rich and specification-compliant, with the latest version, version 2.3, coming with support for XSL 1.0, XPath 1.0 and the Java API for XML Parsing (JAXP). Xalan can be configured to work with any XML parser that is compliant to the Java API for XML Parsing (JAXP) - I'll be using Xerces here - and can also be run as a standalone program from the command line, or within a servlet for XML-HTML transformation. I'm assuming here that you're familiar with XML and XSLT, and know the basics of node selection with XPath and template creation with XSLT. In case you're not, you aren't going to get much joy from this article. Flip to the end, get an education via the links included there, and then come right back for some code. 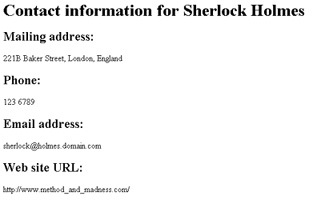 Contact information for "Sherlock Holmes, World's Greatest Detective"
Contact information for "<xsl:value-of select="normalize-space(me/name), <xsl:value-of select="normalize-space(me/title)" />"
Now, we've got the XML and the XSLT. All we need is something to marry the two together. // a particular XML processor implementation. // as an input parameter. Assuming that all goes well, you should now have a class file named "addressBookConverter.class". Copy this class file to your Java CLASSPATH, and then execute it. 1. The name and path to the XML file. 2. The name and path to the XSL file. 3. The name of the output file. Let's look at the code in detail. As always with Java, the first step involves pulling all the required classes into the application. In case you're wondering, first come the classes for JAXP, followed by the classes for exception handling and file I/O. Now, I bet you're wondering, what's JAXP? According to the Unofficial JAXP FAQ, available at http://xml.apache.org/~edwingo/jaxp-faq.html, the Java API for XML Processing (JAXP) "enables applications to parse and transform XML documents using an API that is independent of a particular XML processor implementation". Or, to put it very simply, JAXP provides an abstraction layer, or standard API, that allows for code reuse across different XSLT processors. Next, I've instantiated some variables to hold the names of the various files I'll be using in the application. The first step is to create an instance of the TransformerFactory class. This can be used to create a Transformer object, which reads the XSLT stylesheet and converts the templates within it into a Templates object. This Templates object is a dynamic representation of the instructions present in the XSLT file - you won't see any reference to it in the code above, because it all happens under the hood, but trust me, it exists. Once the stylesheet is processed, a new Transformer object is generated. This Transformer object does the hard work of applying the templates within the Templates object to the XML data to produce a new result tree, via its transform() method. The result tree is stored in the specified output file. This method first checks to see if the correct number of arguments was passed. If so, it invokes the constructor to create an instance of the addressBookConverter class; if not, it displays an appropriate error message. Let's move on to something a little more complicated. Let's suppose that I wanted to convert my address book from XML into a delimiter-separated ASCII file format, for easy import into another application. With XSLT and Xalan, the process is a snap. // get the name of the stylesheet that has been defined in the XML file. Most of the code is identical to the previous example. There are a couple of important differences, though. First, the parameters passed to the constructor are different in this case. Over here, I'm passing three parameters to the constructor: the name of the XML file, the name of the output file, and the delimiter to be used between the various elements of a record. What about the XSLT file, you ask? Well, that's sourced automatically from the XML file via the getAssociatedStylesheet() method of the TransformerFactory class. A new Source object is created to represent this stylesheet; this Source object is ultimately passed to the Transformer class. If you take a close look at the XSLT file above, you'll see that I've defined an XSLT parameter named "delimiter". This parameter is essentially a variable which can be accessed by XSLT, and a value can be assigned to it via the setParameter() method of the Transformer class. In this case, the "delimiter" parameter is set to whatever delimiter was specified by the user. Finally, the actual transformation is performed, the output stored in the desired output file, and a result code generated. Isn't it simple when you know how? Now, if I've done my job right, you should have a fairly clear idea of how to perform XSLT transformation at the command prompt. How about the doing the same in a Web environment? The first step, obviously, is to create a new XSLT stylesheet to produce HTML, rather than ASCII, output. The key difference between this example and the earlier application is the introduction of a new Writer object, which makes it possible to redirect output to the browser instead of the standard output device. Finally, the transform() method of the Transformer object needs to know that, this time, output must go to the Writer object and not to a file. Note the change in the second argument to the transform() method, below. Note that, since I'm using a Writer object, I will have to build some error-handling routines into the class as well. It's instructive to examine them, and understand the reason for their inclusion. The solution to the problem is simple: throw an exception. This exception can be captured by the JSP page and resolved appropriately. This is no different from the mechanism used when catching XML errors with the Xerces XML parser. So that's the class. Now, we need something to tie the class to the Web server. Enter JSP. This example, though intended only as an illustration, should serve to demonstrate how easy it is to perform XSLT transformations in a Web environment with Xalan. And that's about it from me. In this article, I attempted to demonstrate the basics of the Xalan XSLT processor, offering a broad overview of how it work by transforming XML documents into ASCII and HTML formats. I showed you how to write simple command-line Java applications to perform transformations, and then ported these examples over to the Web via JSP. The goal here was to offer you a broad overview of how Xalan works, in order to give you some insight into the processor's capabilities and lay the groundwork for more advanced applications. Did I succeed? Write in and tell me. Note: All examples in this article have been tested with JDK 1.3.0, Apache 1.3.11, mod_jk 1.1.0, Xalan 2.3 and Tomcat 3.3. Melonfire offers no support or warranties for the source code in this article. Examples are illustrative only, and are not meant for a production environment. YMMV! This article was first published on 08 Mar 2002.